Has April started off as the cruelest month (per T.S. Eliot)? We hope not! Either way, work breaks are necessary so get ready to head outside even if that means a hat and gloves still. 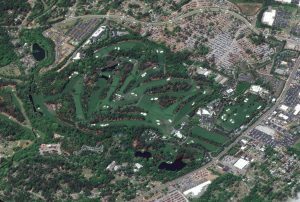 But before you head out, check out this very cool high off-nadir (or taken from a diagonal in space) GeoEye-1 satellite image of the Masters Tournament in Augusta, Georgia, USA collected on April 6, 2018. We have featured the Masters before but it was in 2013 and was not an image of the tournament in progress. The 73-centimeter GeoEye-1 featured here was collected on the second day of the Masters where Patrick Reed ended Friday at 9-under, 2 strokes up on Marc Leishman. Reed eventually won the 82nd edition of the Masters at 15-under, 1 stroke up on Rickie Fowler. When you check out the high off-nadir GeoEye-1 image, be sure to look for the mobs of people spread out across Augusta National Golf Club. This entry was posted in The Geospatial Times and tagged The Geospatial Times, Tips & Tech, Your Imagery Work Break by Apollo Mapping. Bookmark the permalink.